The Three Stooges: The Movie, is a 2012 slapstick comedy film based on the early mid-20th century vaudeville famous for slapstick action and physical farce. 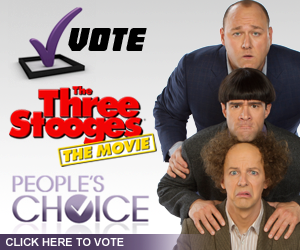 This movie was produced, written and directed by the Farrelly brothers and co-written by Mike Cerrone, and stars Chris Diamantopoulos, Sean Hayes, and Will Sasso, recreating the characters played by Moe Howard, Larry Fine, and Curly Howard. In film, the Stooges were commonly known by their first names: "Moe, Larry, and Curly". It is composed of three episodes done in a modern setting. Moe, Larry, and Curly have wreaked havoc in the place from the day the three were dumped on the doorstep of the Sisters of Mercy Orphanage. While the nuns were often terrified and always on the run for their own safety, Sister Mary-Mengele has always hated the trio. She was mean to them. To get rid of the Three Stooges, exasperated nuns often bring out the trio as being the only three available whenever prospective couple come in to adopt. The Martel couple decides to pick Moe even though another boy, Teddy, enters the picture. On the way out, Moe requested that Larry and Curly join him after his foster parents asked for the one wish that he would want. Moe nearly get adopted, but he ruined his chance wishing for his other two friends to join him. Realizing that the trio were inseparable, Moe was dropped back off at the orphanage, and Teddy was chosen instead. Moe kept this to himself. 25 years later, the trio are still living there. and attempting to help out taking care of the kids. Monsignor Ratliffe (Brian Doyle-Murray) gets attacked by Moe, Larry, and Curly, who thought that Monsignor Ratliffe was making out with the nuns. It appears that Monsignor Ratliffe is there is on official business to deliver bad news. They were informed that the orphanage will be shut down unless they can come up with $830,000 in 30 days. The Three Stooges volunteers to go out and try to raise the money somehow. Most nuns believe that the trio will fail but Mother Superior thinks otherwise. This shows a subplot that involves a woman named Lydia (Sofia Vergara), who wants to kill her husband so she can be with her lover, Mac (Craig Bierko). The Stooges accepts a job to murder Lydia's husband for money, though they naively believe that he's dying and that the money will go to save an orphanage. Little did they know that Lydia wants to inherit her husband's considerable fortune that is why she offers to pay the trio the money they need to take care of the job. However, they botch the job and leave the supposed husband in traction in the hospital. When they try to visit to finish the job, they are chased throughout the hospital and escape by jumping off the roof using a fire hose. They end up running into a now grown-up Teddy (Kirby Heyborne) from the orphanage, who invites them to his anniversary party. It turns out that Lydia is Teddy's wife. Their next scheme for raising the money has them selling farm raised salmon, with them scattering salmon on a golf range and watering them like produce. The trio are chased off the golf course and hide in an old building, where they have a slapstick fight. Larry and Curly then scold Moe for not accepting the adoption with Ted's adopted parents because with the wealth they had, he could've used it to help save the oprhanage. After deciding to split up, they left Moe alone. It turns out they were all on stage in front of an audition crew, who select Moe to be the newest cast member of Jersey Shore as "Dyna-Moe". Larry and Curly are getting along well without Moe but decide to go find him, first returning to the orphanage, where they find out a girl named Murph is very sick, but has not been taken to the hospital because the orphanage has no medical insurance. It turns out that no one will insure the orphanage due to the trio's numerous accidents and injuries, and the $830,000 is needed in order to cover medical bills that accumulated over the years. Larry and Curly later meet up with Ted's adopted father about what happened at his office. He confessed that Moe wanted him to go back for his friends to adopt them and he didn't want to so he gave Moe back and took Ted in his place. They finally go to the set of Jersey Shore to reunite with Moe, and they all head to the anniversary party where they appear to thwart the murder plot, only to get chased by the angry Lydia and Mac after they accidentally ruin their wedding cake while saving a little girl's life. They discovered that Mr. Harter was the real mastermind. He married into the money and was furious to find out that all the money was left to Teddy and not him when his wife died years earlier. They were taken for a ride, but the car winds up in the water when Curly's pet rat distracted them. They all escaped when Curly passed gas, and they light it with "waterproof, strike-anywhere matches", causing an explosion that blew out the windows. Once they are back on land, Lydia, her lover, Mac and Teddy's adoptive dad are arrested, and Teddy thanks the trio for saving him. When they request the $830K, he turns them down, stating he refuses to help the same orphanage that gave him up to a father that almost tried to kill him, among other things over the years. Three months later, the trio return to the now-condemned and abandoned orphanage, but as they start crying for feeling like failures, they hear kids laughing, swimming, and playing. When they investigate, they find out a whole brand new orphanage was built next door, complete with a swimming pool and tennis court. They soon learn that the money came from the Jersey Shore's producers who consider this as an advance payment in relation to a new reality show "Nuns vs Nitwits", in which the entire trio will be part of. Murph is revealed to be perfectly fine, her illness due to too much iron in the water. Murph and her brothers Peezer and Weezer (the latter thought to have been lost forever to a foster home), were be adopted by Teddy and his new wife, Ling (Emy Coligado). In the end, after Curly accidental knocks Sister Mary-Mengele into the pool with a folded-up diving board, the trio runs away and bounce off trampolines out of the orphanage onto mules. They rode away from the orphanage, thus ending the film. Though the Stooges are generally good-hearted, they were exceedingly violent to one another. Although this constant slapstick has no consequences for the Stooges themselves, the secondary characters do receive injuries. Expect a few sexual situations and comical innuendo, as well as insulting language like "stupid," "moron," and "shut up."